GD didn’t make spaghetti and cake. I think it’s more a contrast between the machine and the middle-class suburban lifestyle of the aircraft workers (and, more generally, taxpayers). Fair enough, and I like the spaghetti in this context, but GE made the F1-11’s radar and I can’t see what the light bulb would be doing there if he wasn’t trying to make that connection. But I’ll take out GD, it’s just confusing. It’s really too bad that the NY MOMA doesn’t have it on display. When I first glanced casually at the first picture I thought that the background showed some kind of pagodas and a tree! Looking at it more closely after reading the comments, I saw that all the pictures are images of war – the “pagodas” are actually tanks, and the whole thing is super macho. (I don’t understand the reference to “GD”). 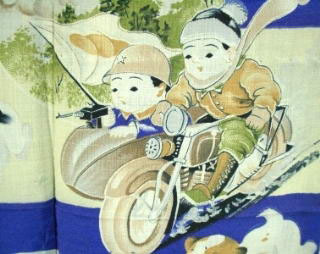 The boy’s kimonos make me remember cowboy-print shirts. Was I ever fortunate enough to wear one of those beauties, or did I just stare at them? For glum associations, I suppose there’s polyester -> oil fields -> Native American genocide. Surprisingly, a quick web search doesn’t turn up any documentary images. I do find aircraft-carrier Hawaiian shirts, though, with hibiscus explosions. GD = General Dynamics. I had written that they manufactured the F1-11 aircraft, but M pointed out it was irrelevant, and I took them out. Ray, I ought to have mentioned that I do also love the kimonos, especially the ones with battleships and planes on, I think they’re fantastic. Insightful visual parallels, thank you for them! I have included a link to them in the original post. 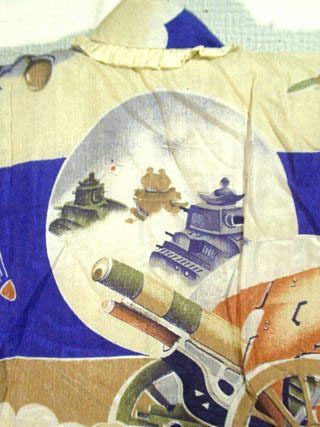 I think some of the kimonos might be earlier than 1937, but this decade of Japanese military history was not only hallmarked by Nanking but also by the cruel exploitation of Manchuria, Korea and later of China running through all this period. Thanks for the link. Have you been to the exhibition? I must say, I almost feel like going. I was at an earlier station of the wandering exhibition, in Moscow last year. But friends say that the Petersburg exhibition displayed a much richer choice from the collection. It is certainly worth to visit. Unfortunately it closes the day after tomorrow. However, at any time you go to the great Russian cities you will certainly find one exhibition or two characterized by a peculiar alloy of shocking absurdity, fascinating beauty and an almost scrupulous historical care. I personally have learned a lot from this typically Russian approach to putting things on display. Well that REALLY makes me want to go. I’m a sucker for shocking absurdity. Too late this time, though.